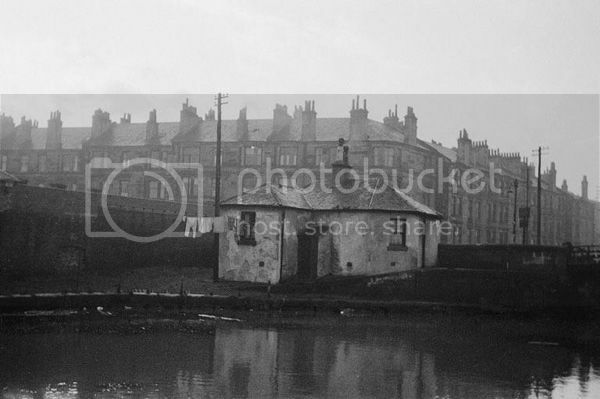 Can anyone give me any sources on the background or history of the people who used to live on the canalside attending to the lifting and closing of the original overbridges on the Forth & Clyde canal? These bridges were wooden and of the bascule design which opened to allow masted sailing barges through. The last of them were converted to fixed concrete bridges in the earl 1960s. When very young, I lived near the overbridge at the top of Northpark Street in Maryhill. I can recall traffic being delayed while the bridge was raised; I even have a photograph of this everyday scene. However, I cannot trace any references in any existing texts or websites to the people who operated the bridges. From my own memory I can recall Mr Turner who lived in a white washed cottage at the side of the Bridge at Northpark Street. His kids went to the same school as me and we other kids were all well aware that they were really, really poor; even by our not well-off standards. I still have a vivid memory of being at an enormous great party in their cottage where I was amazed at parrafin lamps and people playing 'real' musical instruments. I stayed far too late. When I got home, after the statutory doing from my mother, she worried about whether I had been all right staying at that house 'where travelling folk came'. Seems to have been another little segment of the working population that has vanished from history along with the industry they worked. There's a bascule bridge at Portpatrick Road in Old Kilpatrick which is about to be opened as there are two boats coming through the locks at the Erskine Bridge right now. Unfortunately the batteries in my camera are needing charged. The bridgekeepers cottage is still there as is the one at the swingbridge on Ferry Road. These days British Waterways send a couple of guys down in a van to operate them when boats are passing through. And just as I type the boats are passing my window. Whilst researching my family history I found some ancestors living in Bridge End Cottage, Kelvindale Road, Maryhill in the 1901 census. Could this be the same place? This was my great grandfather and his wife and children. They were Williamsons from the north east of Scotland. Don't have any photographs of the house or any of them though. A la circa. 1790's probably Crusty. Made them to last ..... My great-grandfather (yes, great) was a canal boatman and is listed on the 1881 census as such. He was dirt poor. Crusty yes that is very similar to what I remember being the type of cottage the Turner family lived. As I mentioned before, they were lit by parrafin lamps and I seem to recall the floor being either hard stone or granolith with some bits of carpet and linoleum on top. For a wee boy it was a fantastic den of a house... just like one Hagrid must have grown up in. Escotregen, thanks for the information. Now that I put my thinking head on tightly that water has to be beneath the canal. Can't think why they moved up into Maryhill itself and then to the Gorbals (work probably). Good luck with your search! Tamandee, you referred to the Williamsons. This was, and probably still is, the name of a travelling family based in Fife. I think they name is well known to collectors of traditional songs. TCI, I don't think it is the same ones. My lot are railway workers from Elgin. Interesting, though. Who knows where they were before Elgin (I'm stuck in mid-19th century Elgin and can't get any further back with the family tree). The name is a travelling name in that area as well. possilonian (and I love that name ) thanks for that info about a Gordon Turner. It's these little nuggets of info that can provide big breakthroughs. Even if he was not 'my' Mr Turner, it was common in those times for whole extended families to be in the one trade - so it's odds-on he is at least 'in the family'. I had a look at the Mitchell but nothing rang a bell.